Joshua watched as the challenger withdrew his Snorunt and sent out a Pachirisu. Pachirisu was an Electric-typed Pokemon, meaning that it had a type advantage against Joshua's Scyther. This was all just thought out a moment before the challenger commanded his Pachirisu to use its Spark attack on Scyther. The Pachirisu started glowing blue with electricity as it charged towards Scyther. "Scyther! Focus Energy! ", Joshua commanded. Joshua's Scyther complied and used its Focus Energy to calm itself down and make itself more alert to the surroundings. The Focus Energy enabled Scyther to easily dodge out of the way of Pachirisu's Spark attack by rolling over to Scyther's left. Ceru sighed, pouting. He was right. Pachirisu wasn't cut out for this. But that couldn't stop him.. That couldn't stop him now. He had to get through this, he had to get this dang badge. Pachirisu could do it- Battles were equally part the Pokemon's skill AND the trainer's skill. He just had to work harder, and they could make it through this. "No use giving up now, eh? Might as well see this through." Taking a step back, Ceru readied himself as Pachirisu skidded to a sharp stop, turning to make an annoyed face at Scyther. "Pachi, Charm!" "Pa... Chi?~" Pachirisu complied, putting his tiny paws to his mouth and moving his body to make it look as if he was blowing kisses at Scyther, doing this with each of his paws. When he finished, a small swarm of pink hearts flew at Scyther, aiming to decrease his attack sharply. Joshua grimaced as Scyther was affected by Pachirisu's Charm attack and lost its battle stance. Charm was an attack set out to lower the opponent's attack strength. Joshua knew that he had to act fast with Scyther before continual Charm attacks weakened Scyther too much. Joshua commanded Scyther to use Fury Cutter. Scyther complied, charging and quickly closing the distance between itself and Pachirisu, preparing to land a Fury Cutter on the Electric Pokemon. Ceru laughed quickly as Pachi's attack hit, but his laughter was abruptly cut short as Pachi got hit by Scyther's fury cutter. "Crap crap crap crap! Pachi!" Pachirisu had fallen to the ground, about a foot or so from Scyther. Pachi let out a strangled sound as he struggled up off the ground- Regardless of this, he wasn't beaten yet. "Pa...Chii..!" Pachirisu quickly lunged off of the ground, scooting back slightly and getting on all fours. "Yes! Pachirisu, Spark!!" Pachi smiled and pounced at Scyther's chest, blue sparks blurring and merging around his tiny body a he performed a close ranged Spark. Joshua was unfazed by the Pachirisu's Spark attack. Joshua knew that he had to build up Scyther's momentum for Fury Cutter quickly to counteract the Charm attack that had been used on Scyther earlier. Knowing that Scyther definitely could not keep at a safe distance from the Pachirisu while building up his momentum. Joshua had made up his mind. He commanded Scyther to continuously use his Fury Cutter, building up his momentum quickly with each hit while bracing itself from the Pachirisu's attacks. Ceru clucked his tongue and shook his head. "Pachi, backwards!" Pachi responded and jumped backwards, getting some space between him and Scyther but only for a brief moment. Scyther continued on and Ceru glared, waving his hand eccentrically in the air. "Okay, Pachi, I'm sorry about this in advance. Let's go! Spark!" Ceru pointed his hand directly at Scyther, recreating the finishing moment with Snorunt versus Ledyba by making his hand into a gun. "Finish it! Full power!" Pachirisu nodded and lunged at Scyther, blue electricity forming and spiking around him. He'd go directly at Scyther, most likely hitting him, but he would take his own damage as well. Ceru was just hoping that Charm had lowered Scyther's offensive capabilities enough that Pachi wouldn't be severely injured. Joshua's normally calm and composed expression changed to an interested and somewhat excited one...he had never experienced such a heated battle before that it actually cheered him up inside,he was even smiling! He however,quickly realized the oncoming threat and his expression changed back to his quiet and serious nature once more as his Scyther charged forward slashing at Pachirisu with it's Fury Cutter. The two attacks collided,the Charm had somewhat weakened the attack but Fury Cutter's repeated use still caused it to deal some damage. After the clash Scyther was staggering a little bit but had fight left in it. However,small jolts of electricity danced on Scyther's body as it winced in pain struggling to move...Pachi's Spark had paralyzed it. Knowing he was at a serious disadvantage he ordered Scyther for one final attack! "Scyther! Charge at it with Quick Attack!" Ceru let out a low growl of annoyance, something that wasn't normal for him. The battle was exciting, yes, but Pachi was hurt enough already. The little Pokemon struggled off of the ground and sparks formed around it's cheeks, letting out angry sounds. "Pa, Pa, Pachi, Pa, Pa!" Pachirisu announced with distaste, sprinting backwards again before Scyther began his attack. ".. Okay, Pachi. I know you're hurt, and I know you're tired. But now, this fight is over. You can finish this. Hell, for your first battle, you're doing great." Ceru tilted his head and smiled at Pachirisu, and Pachirisu responded in kind with a look of wonder. "This is over, Mr. Gym Leader. Pachirisu, Spark!!!!!" As Ceru called this out Pachirisu skidded to the side on the ground, moving as fast as he possibly can. His body flared with blue electricity again and Pachirisu charged at Scyther's quick attack, bursting along the ground. The air crackled with energy and tension, and Pachirisu pounced roughly off the ground at Scyther as he neared him, this last attack deciding it all. Joshua's eyes widened greatly as he saw what had happened. Scyther was nearly down for the count and his Quick Attack was his last ditch attempt. Scyther and Pachi collided with a blast as the gym floor itself rumbled slightly as the dust kicked up on impact. Moments later the dust settled,Scyther was standing there panting heavily as it glared angrily for a moment,when his legs wobbled and he collapsed onto the floor defeated and stunned from the electricity. Joshua had lost but he was happy inside from the battle. "That was a great battle kid,you have some potential in you and your pokemon. Maybe one day you'll become a Gym Leader yourself cause you have skill. Here's your Harvest Badge!" 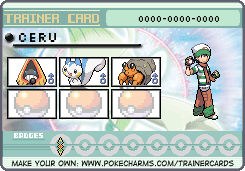 Joshua approached Ceru,as returned Scyther to it's Poke Ball and handed Ceru his Gym's Badge. Ceru let out an exhausted laugh as he saw he won. Allowing himself a smile, he took out Pachi's Pokeball as the little Pokemon struggled on the ground. Pachi was hurt, but not fainted, which said something amazing about his skill. Despite this having been his first battle and the fact that in about two seconds the Pokemon would be out cold, Nichi was incredibly proud of the new addition to his team. Clicking a button on his Pokeball, Pachirisu was absorbed in red light and returned. Ceru pocketed the Pokeball and gently took the badge from Joshua, cherishing it and his words. "Thank you. Truly" Ceru said sincerely, smiling at Joshua. He turned to leave and walked a few steps before turning back and waving to Joshua. "You're not too bad yourself.~" Ceru giggled at that and sprinted out the door.